Nokia has just made the rumoured N810 WiMax tablet official. Its basically the same tablet with WiMax included. It features a great 4.13″ touchscreen, a built-in GPS, a QWERTY keyboard and runs OS2008. It also has a darker metallic finish and a orange base tone. More pictures. Q&A with Urho Konttori, Project Manager, Nokia N810 can be found here. The folks from the Nokia Research Center in Germany are working on a very exciting prospect called the “noBounds”. The project aims to provide a low-power solution for mobile users to extend Smartphone and Internet Tablet screens and project them to higher resolution external displays such as high definition TV’s, projectors and near-to-eye displays (NED). Via USB or WLAN the project aims to let those devices output video at Full HD (1920×1080p) – 30 FPS. This opens up tremendous possibilities, currently TV out capable phones such as the N95, N82 can only output at QVGA resolution (apart from the Gallery) and the ability to output at HD will certainly make the the current smartphone a portable computer. Although now much is known about how this will work, one big positive is that all that is required for it to work is a software update. The Application is currently running on a N810 Maemo Internet Tablet and apparently uses very little battery. Internet Tablet Talk received an email announcement which you can find after the break. 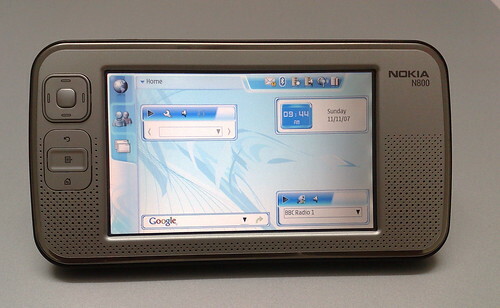 The N800 as a media device performs reasonably. However the clear lack of support for some codecs does mar it a little specially in the video department. It failed to play mp4 videos recorded on the N95. Since I have been carrying these devices together for a while now, I wanted to play some video I’d just shot from the N95 and when it failed to play I was almost shocked. A modern smartphone such as the N95 can handle most formats thanks to a great third party application called the Core Player; the N800 is based on a open source platform and it is surprising that an effective video player for it is not out yet. Some 3rd party options include Canola, Kagu Media Player and UKMP. Another great application is UKTube which gives smooth YouTube video playback, however these may not be needed soon due to OS 2008 coming! Its apparently available ‘unofficially’ even now! The only way out is converting video which I’m not a great fan of. This is a waste of the gorgeous screen. However things are not as bad as they seem for there is a silver lining, the new 2008 OS which the N810 will ship with is also coming out for the N800. It promises wider codec support amongst other things; a clear reason to rejoice for the existing owners.